Malaika Mataba (l.) and Shula Selby helped draft the letter that led to Bronx Lighthouse Charter School to cancel Ted Cruz's appearance Wednesday. Ted Cruz has gotten a lesson in "New York Values". Ted Cruz came to New York Wednesday to talk about education. Unfortunately for the republican candidate his idea to use a charter school as a prop didn't go as planned. 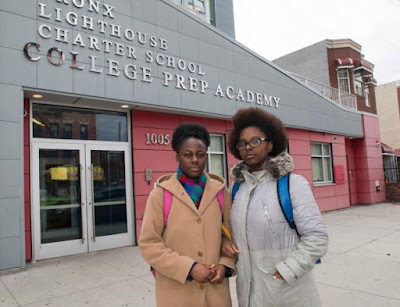 Cruz was scheduled to speak at Bronx Lighthouse College Preparatory Academy until students wrote a letter to the principal asking her not to let Cruz come, prompting staffers to cancel the appearance.